Since I began my creative life with embroidery it followed that when I discovered bead embroidery I'd be totally taken in by it! While embroidering with beads is certainly different than with thread or yarn, I find that I get the same satisfaction from doing it. And, as with most of what I do, I find that I improvise a lot. Here is a picture of one of the first projects I made using bead embroidery. 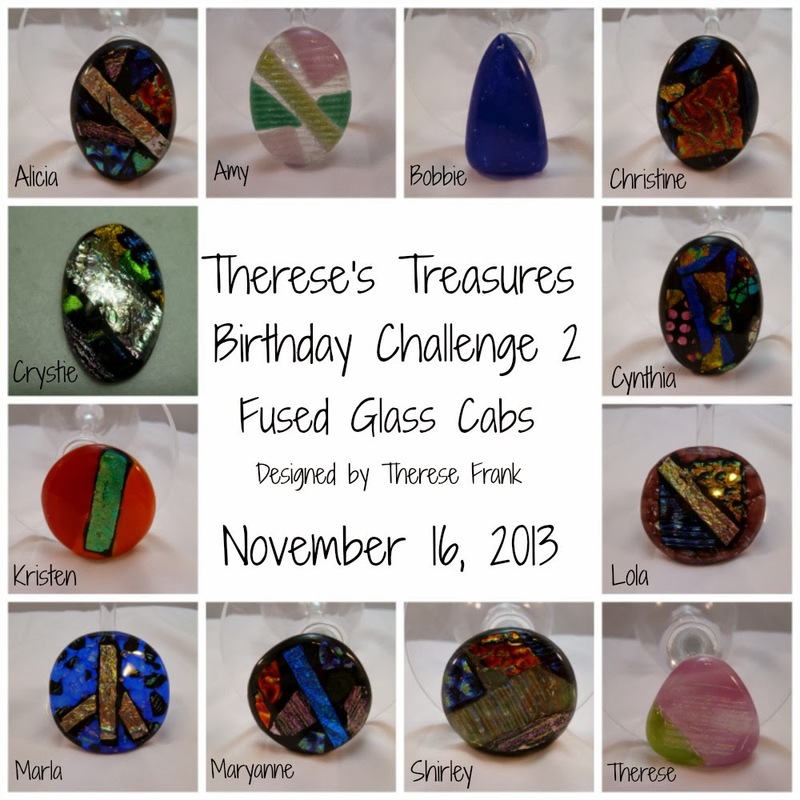 I used a Czech glass button as the focal and took off from there. I learned several things from this cuff. I think the most important thing was that using the same color beads with different finishes give a piece lots of texture and variation. I also discovered that you can incorporate some peyote stitch in embroidery for an accent. In this piece I worked a peyote tube off a back stitched row of beads. You can see the peyote tube in this picture. I also discovered that I like short fringe using lentils or glass rings in a bead embroidered piece. Some fringe with the glass rings are coming out of the peyote tube. 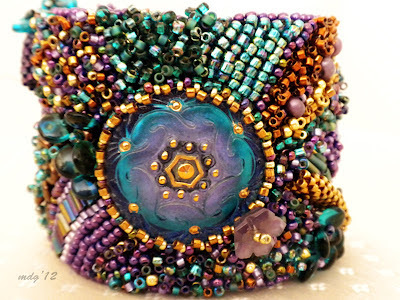 This was a fun project for me because I learned so much from it and I ended up with a very wearable cuff. I learn things from each project I do because each one offers it's own opportunity to try something different. My favorite books on the subject are Jaime Cloud Eakins' books, especially her new one, Dimensional Bead Embroidery. Sometimes I just pick it up to look at all the eye candy. But, it also has wonderful information and guidance on design and stitches. 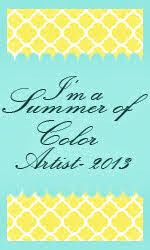 Sherry Serafini is also very inspirational and provides lots of eye candy and good instruction in her books. 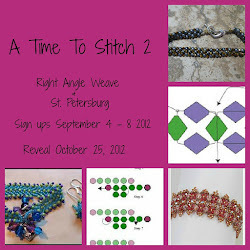 Check them out if you haven't already and you're interested in bead embroidery. Well, thanks for stopping by today. I hope you have a great day! WOW! This piece is SPECTACULAR! The colors are so pretty and the texture is amazing! 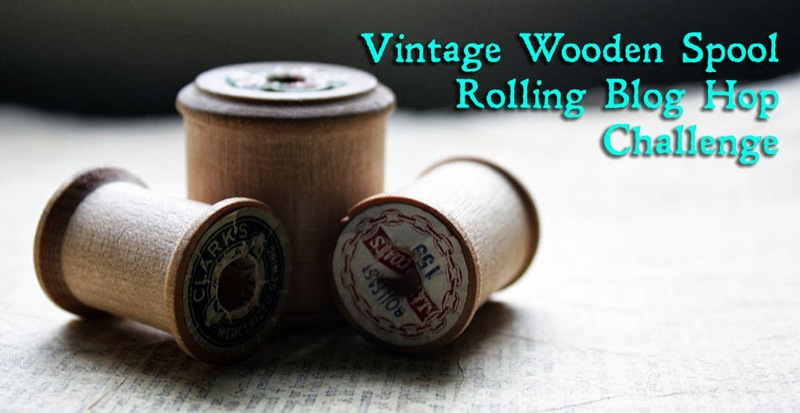 I loooooove the peyote tube on there - I have never seen that before! Your cuff is gorgeous and the focal button what a find beautiful! I love all the depth and texture the embroidered beads give to your piece. 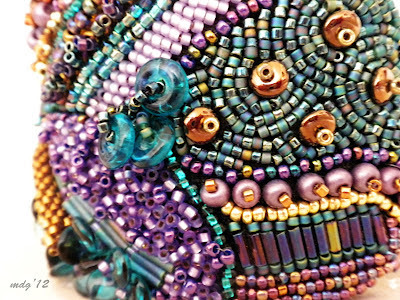 Your beading skills rock! I too love bead embroidery and the freedom it allows to express your art I love the planned randomness of each piece, to me it is like painting with bead. 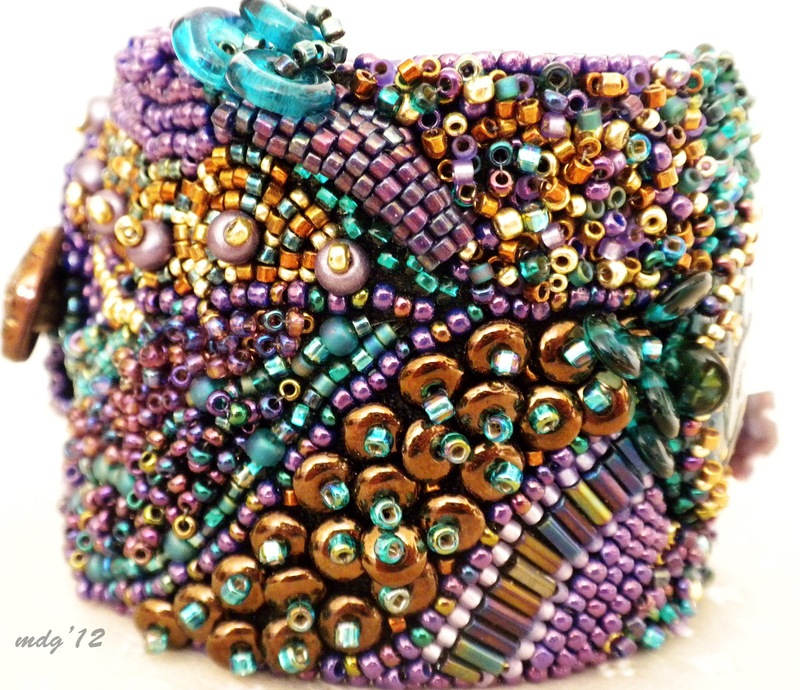 I love your cuff and especially the raku beads and how they bring both brilliance and texture to the cuff. Wow that is one awesome cuff! I love the focal button - just gorgeous. I have only ever made one cuff but hope to do more in the future. You've done a great job - the colours are stunning. Maryanne, what a beautiful cuff! The colors and textures are gorgeous. I love learning about what went into a piece. It's as fun for me as looking at the piece, itself. Thanks for sharing your creative process with us! This is absolutely amazing! I wish I could master this art form! 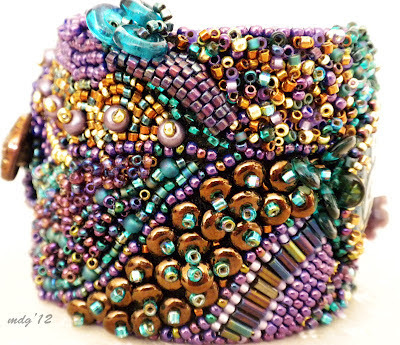 This is gorgeous work, I really want to learn how to bead stitch and especially how to make beautiful cuffs like these. You are an inspiration!